Food Volume and the Energy Density Scale by Jacky Bigger, M.S. Let’s talk volume. I’m not talking about training volume. I’m talking about FOOD! For those of you trying to lose weight, drop a weight class, or just lean out. Volume is going to be important for you. Now, what do I mean by volume? I’m talking about the physical amount of food you are consuming in relation to the energy that it provides for you. When cutting weight, it is important to consume foods that are lower on the energy density scale. “Energy density is the number of calories (energy) in a given amount (volume) of food. By choosing foods that are low in calories, but high in volume, you can eat more and feel fuller on fewer calories.” To put it very simply, a fuller plate, a fuller belly and less over all calories. Fruit and vegetables are great foods to consume that not only add volume to your meals, but also vitamins, minerals and fiber. I took a MP Combat Protein bar with the macro nutrient content of 28g of carbs, 20g of protein and 7g of fat, and turned it a nutritious FULL plate of food. This plate contains 3oz. ground beef (93% lean), 100g roasted red potatoes, 1 zucchini squash (155g), 1 yellow squash (140g) and some mixed bell peppers (55g). The macronutrients are: 27g of carbs, 23g of protein and 7g of fat, basically the same as the macronutrients in the protein bar. I get it, the protein bar is yummy and satisfies that sweet tooth. However, does it really leave you feeling full and satisfied? It doesn’t for me. Does it have any real nutrition value, vitamins, minerals? 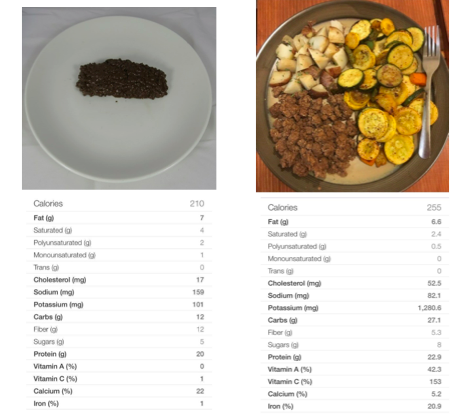 Look at the difference in vitamin content of the two above meals. (Nutrition information done using My Fitness Pal, because that’s the way most of my clients count and tracks macros). The micronutrient content of the meal made from whole foods far outweighs that of the protein bar. More volume and more nutrition produces happier bodies and better performance. The plate full of food looks much more appetizing to me than the turd shaped protein bar. I’m not telling you to never ever eat a protein bar or that I never eat them myself. The point is that whole foods are always the better option when you have the choice. Protein bars do come in handy when traveling or when on the go all day. However, they should only be added into your eating plan once you already have a really good handle on your nutrition and you’re already consuming mainly whole foods. Article titled “High intake of fruits and vegetables predicts weight loss in Brazilian overweight adults” – Daniela Sartorelli et al. studied 80 adults who were attending a Nutritional Counseling program. They used a food frequency questionnaire to study their diet habits. This questionnaire was filled out at baseline, and 6 months later. Results showed that the increased intake of dietary fiber from fruits and vegetables was associated with a greater weight loss. A BMI analysis titled “Comparative Analysis of BMI, Consumption of Fruits & Vegetables, Smoking, & Physical Activity Among Florida Residents.” – Joan S. Goss et al. Compared the BMI of several counties in Florida. This analysis supported their hypothesis that “consumption of three or more fruits and vegetables per day was significantly correlated with lower BMI regardless of smoking or physical activity.” The study found that seven counties with the lowest BMI consumed significantly more fruits and vegetables than the seven counties with the highest BMI. I know that BMI isn’t the best measurement in the world, however, for a general population is still gives us good insight. If cutting weight, or just trying to be heathier, fill your plates with higher volume foods. Eat ALL the veggies! I know I wouldn’t have survived my weight cut without them, and I promise that yours will be much easier if you add them in as well.